This Beijing China Travel Guide is composed basing upon my very personal experiences of living in Beijing for ten years. I wish it can help foreigners in China to explore the best places of culture and interest of Beijing city. Ming-Cheng-Zu, the 3rd emperor of Ming Dynasty set Beijing as the capital in 1422. 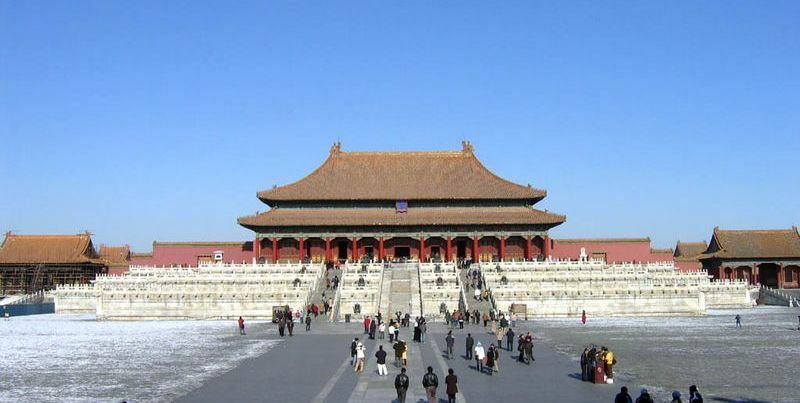 Generally speaking, the most distinguishing and featured places of Beijing city are its ancient architectures. There are mainly two categories of these architectures: one is royal buildings like palace, royal garden and tombs; the other is Buddhism temples. In 1422 A.D. of Ming Dynasty, Ming-Cheng-Zu, who was one of the most well-achieved emperors in Chinese history, moved the capital from Nanjing city to Beijing. The majority ancient buildings in Beijing that you can see today were built in Ming Dynasty and the following Qing Dynasty. Now let's go to see them one by one. In the following Google map of Beijing City, each balloon represents a place of interest. You can click any balloon to see a picture of the place. You can click the "+" or "-" button to zoom in or out or drag the map to see different parts. China is a very populous country. Tourism places like royal buildings are often very crowded. It may not be a relaxed and enjoyable experience to tour a royal garden being packed. So try to pick an off-peak date and time to visit them, such as non-weekend days or evening time. Temples are normally not that crowded. 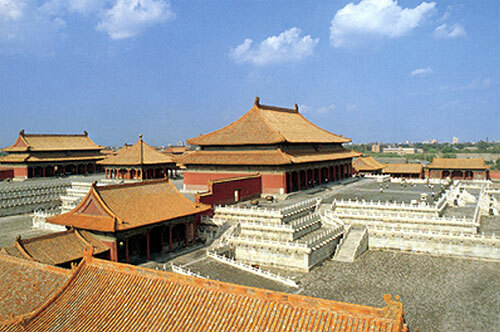 Gu-gong is the royal palace of 24 Emperors of Ming Dynasty (1368 - 1644) and Qing Dynasty (1644 - 1911). Gu-gong is not a single palace or courtyard, but a huge compound containing numerous palaces. It is a city. It occupies an area of 720,000 Sqr meters and includes over 90 courtyards, 980 buildings and 8704 rooms. It was finished construction in 1420. The palace architectures in Gu-gong compound are the biggest scale and best preserved ancient architectural complex in China. The whole layout of Gu-gong compound is symmetric with respect to a north-south axis. This axis is also the central axis of Beijing city. Looking from a high place, Gu-gong is like a sea of palaces looking grand, noble, solemn and harmonious. The current Gu-gong Museum is said to be preserving more than one million items of ancient art relics. Many palaces in Gu-gong compound have been established as categorized special art museums including History Museum, Painting Museum, Chinaware Museum, Bronze Museum, Craftwork Museum, Toy Museum, Stationery Museum, Jewellery Museum, Clock and Watch Museum, Stamper Museum etc. When Chiang Kai-shek and Kuomintang withdrew to Taiwan after losing the civil war in 1949, they moved a significant amount of Gu-gong relics over to Taiwan and are preserving them in the current Taipei Gu-gong Museum. Both Gu-gongs are preserving some very good items. The combination of the two Gu-going Museums in Beijing and Taipei is the complete collection of ancient Chinese cultural relics. After traveling to many countries all over the world, I find that western culture's royal palaces and Chinese royal palaces both have their unique features. They are the best representations of the architecture art of each respective culture. Western palaces are made of stones. Western palaces use a lot of lights, oil paintings, and gold to decorate the inside. Western royal gardens have a lot of flowers, sculptures and fountains. Chinese royal architectures are made of wood. Inside Chinese palace, there are a lot of well-crafted instruments. In the courtyards of Chinese royal compound, there are a lot of stone-made sculptures of lions, dragons, and stone railings etc. Tian-tan, The Altar for Heaven. Tian-tan is located in Chong-wen district of Beijing. It is the place where Ming Dynasty and Qing Dynasty emperors pray to heaven, pray for good harvest and pray for rain. Tian-tan is of the largest scale among all China¡¯s ancient architectures for fete and praying. The central buildings of Tian-tan were built in 1420 of Ming Dynasty. Tian-tan was improved and extended during Qian-long period of Qing Dynasty. The outer wall circumference of Tian-tan compound is 6553 meters and the inner wall circumference is 4152 meter. The whole area that Tian-tan occupies is four times as much as that of Gu-gong, the Forbidden City. The Summer Palace is pronounced as Yi-He-Yuan or Yee-Her Garden in Chinese. It is located in Hai-dian district of Beijing. It occupies an area of 4400 acres. It is a royal garden built in 1750, which was Qian-long period of Qing Dynasty. Yee-Her Garden is famous for its excellent garden design art in perfect combination of man-built architectures with natural mountains and lake. It is an outstanding representation of the peak period Chinese gardening art. Actually when I was studying English in secondary school I did not understand why Yee-Her Garden was translated into Summer Palace. Later after I went abroad, I understood that a western country emperor normally has a Winter Palace and a Summer Palace. Fa-Hai Temple is a small temple. However, the frescos in this temple are the very best in terms of craft work. I have been there. The temple attendants blocked all direct sun-lights from coming in so that they could achieve the best effect of preserving the frescoes. The attendant firstly showed an introduction video to us before showing us around. Particularly he let me have a close look at the details of one fresco via hand torch light. I was amazed by what I saw. I could not imagine that there would be any better frescoes in this world. Portrait of Water-moon Bodhisattva is one of the well-preserved frescoes in Fa-Hai Temple, Beijing. Every place of the portrait looked colorful and in great details. The frescoes were kept so well that the color saturation was perfect. 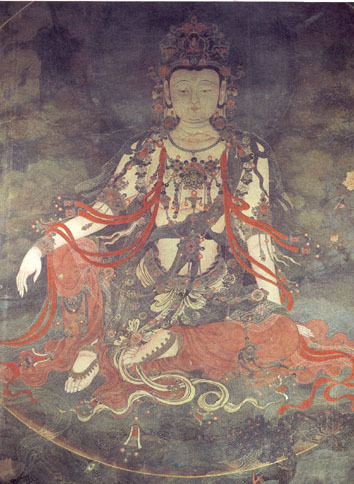 In the frescoes, there was one portrait of the Water-Moon Bodhisattva. A transparent muslin hung down from her shoulder. Could you imagine how the transparent muslin was drawn? The muslin was composed of hexangular flowers and each petal of the follower was composed of dozens of golden threads. Wow, no wonder why it looked transparent. Under the torch light, every thread looked shiny! The attendant showed me another detail in the frescoes. It was a pig in the portrait. The guide said, "See the eye of it. How kind it looks." Has any impressive thing happened in your trip? Have you discovered any wonderful place to visit? Why not share it with everyone here and tell the when, where and what? You must have taken a lot of wonderful pictures as well. Please upload your single best photo of Beijing here! Return from "Beijing China Travel" to home page of "Foreigners in China"